One of the sons of Ishmael (Gen. xxv. 13; I Chron. i. 29). The name is also applied in Scripture to the tribe that sprang from him, and is likewise used for the Bedouins generally, whose characteristic traits are ascribed to Kedar (Cant. i. 5; Isa. xxi. 16, xlii. 11, lx. 7; Jer. ii. 10, xlix. 28; Ezek. xxvii. 21). While very little is known of Kedar, the head of the tribe, his posterity, called also the "Bene Kedar" (Isa. xxi. 17), are described as barbarous tribes in connection with Mesech. "Woe is me," says the Psalmist (Ps. cxx. 5), "that I sojourn in Mesech, that I dwell in the tents of Kedar!" According to other passages, they appear to have been rich in flocks of sheep and goats, in which they traded with the Syrians (Ezek. xxvii. 21; Jer. xlix. 49). They dwelt in tents of black hair (Cant. i. 5) in the midst of the wilderness of Arabia, and were known as skilful archers (Isa. xxi. 17). But they also settled in villages or towns (Isa. xlii. 11). 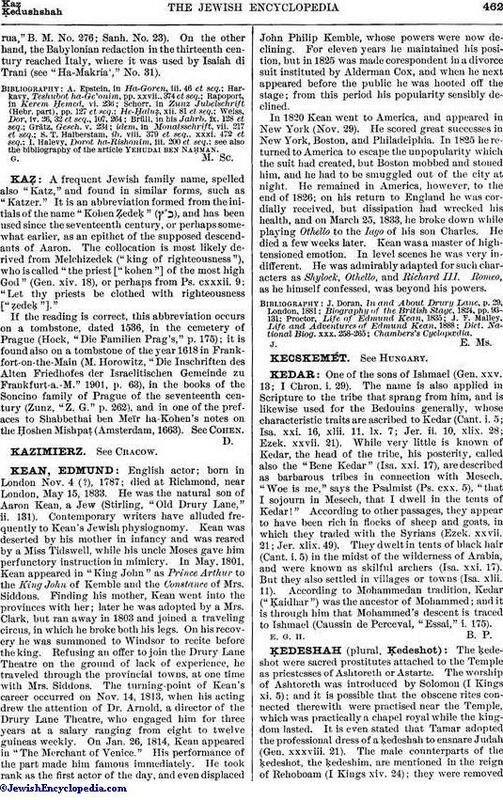 According to Mohammedan tradition, Kedar ("Ḳaidhar") was the ancestor of Mohammed; and it is through him that Mohammed's descent is traced to Ishmael (Caussin de Perceval, "Essai," i. 175).